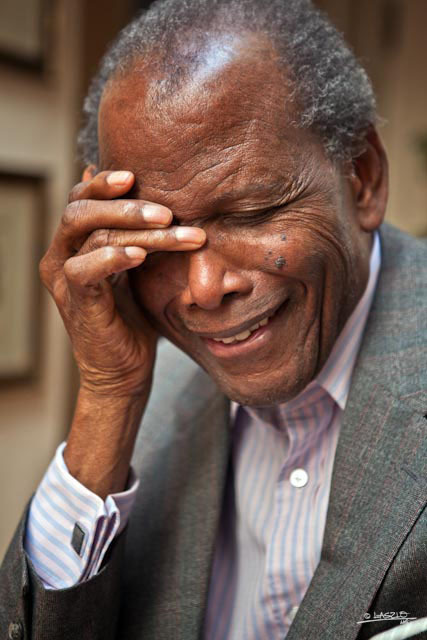 Sir Sidney Poitier is a cultural and historical icon: an actor, director, producer, best-selling author, humanitarian and the recipient of the Presidential Medal of Freedom – our country’s highest civilian honor. The millions of us know him as the first Black American to win the Academy Award. He is the man who changed film history. He is the man who changed history. 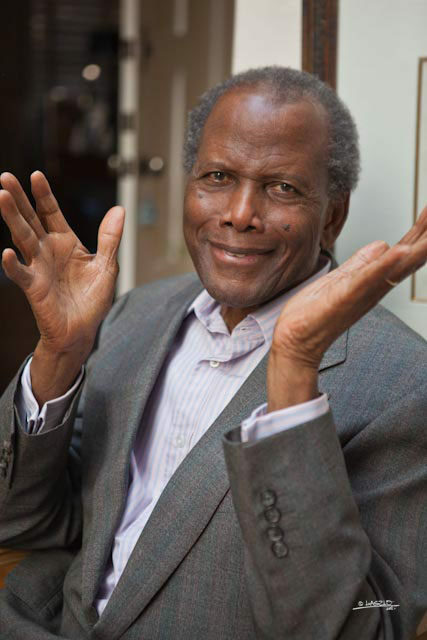 Bahamian Sidney Poitier arrived in the States as a teen, surviving with what little monies he earned as a dishwasher in New York. 70 years later, he is now an American, a diplomat, and all the aforementioned and endless more. 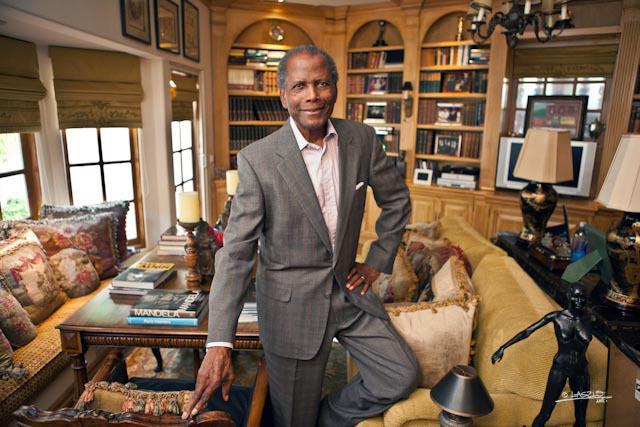 But, perhaps his most congratulatory feat is a personal one: fathering six, grandfathering eight, great-grandfathering three — and being married to his beautiful best friend of 40 years, Joanna Shimkus Poitier. As an adult, I now realize it’s quite the gift to be someone who can say I’ve known him for pretty much my entire life. My friends and I always addressed him as Big Sidney. Or Big Sid – to differentiate himself from Little Syd, our friend and his youngest daughter. We would phone the house and ask for “Sydney” and always jokingly, he’d respond with a “Well, hello! This is Sidney!” — and then pretend to be surprised when we told him we wanted to speak to the girl one. He was always just a dad. The dad who couldn’t go to bed at a reasonable hour since he was on duty to pick us up from our late nights in Westwood. He’s the dad that opened up his car trunk to a handful of giggly girls. 10-year olds standing around him with our mouths gaping open as he took out two 10 gallon cartons of Cookies n’ Cream ice cream for our sleepover. He’s the dad with the longest legs in the parent/child 3-legged race at Buckley’s Junior Olympics. Even today, he comes to his kids’ parties. If he isn’t dancing to Salt-N- Pepa and Michael Jackson with all of us, then he sits there watching us with a smile on his face, as though he’s digesting all the beauty in the room, all the beauty that is his life. Despite all the metals, honors, accolades and marks in history that he has imprinted in this country and internationally, he is still a modest, graceful, gentle and kind Big Sidney. He is still just a dad. I can think of no greater father and grandfather figure (of course, other than my own) who seems to have prioritized life so remarkably and honorably. It’s evidenced in his career choices — and more importantly, in his family life. 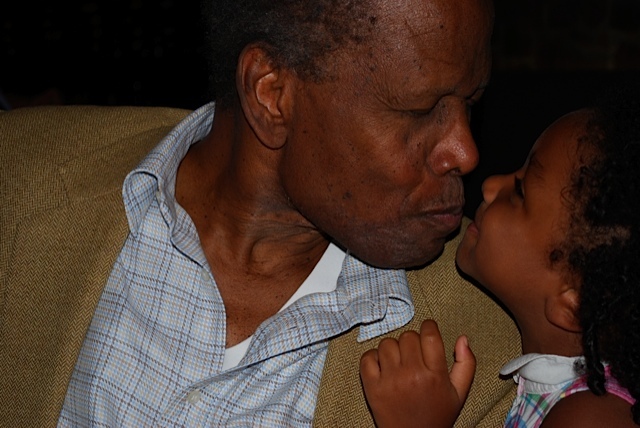 I carry the utmost gratitude that he was so generous in discussing with me — his words and life wisdom on how to gift a child guidance through life. He provided me with answers deeper and more philosophical than I had anticipated for my seemingly simple questions. His answers were humbling. Rather than the 1-10 tangible how-tos you read about in parenting publications, doctor research and blogs, he focuses (and has focused) on simply placing trust in the child. He offers a mere two steps. Love the child and trust the child. Only he can make it so obvious and simple. Can you tell me what motions in parenting can lead a child to become a successful adult? [Laughs] Well, that’s an extraordinary request! Because every birth is an individual person onto itself, and you are speaking of a kid, a child. We have no idea how that child will mature and in what direction. You can look at the child and the child is not yet on its feet [and he/she is] not yet understanding anything, really. There is a sense that that begins from a minuscule something in the child — and the child over time becomes familiar with the world – through the relationship with the mother/father. It is a process with every child that is born. And every mother that brings that birth into life. But so much has passed onto the child beginning in small bits. And it stays there and grows. The [parents] know by instinct what the baby requires — and the parent[s] and child mature into a pattern. It becomes habitual. The relationship begins when the mother nurtures them by bringing food; then over time, the relationship between them matures into patterns that the child will become to recognize…from very small moments [to large] sets of life circumstances. So you’re saying let nature take its course and there’s nothing on the parental side that needs to actively be done? Well, the [parents are] going to prepare for the child. They provide the needs of the children. If the father and mother are of a nature where togetherness comes into a parental unit, that’s wonderful. But – as far as mom is concerned — [the baby] know[s] what it feels like to be in her arms because they’ve been there since the moment they were born. The mother is crucial. But [parenting] is about the coming together of the mother (and/or father/grandma/grandpa) and the child. All those things are the absolute necessities above all else. That’s so interesting. I always think about what I can do more. But it seems like you give the child so much more credit because they’re their own being which is humbling. I need to relax. You say just let nature take its course. The child just needs love from the parents and then the child will become who he/she will become. How do you give your child the best – but balance that with making them care about other people as well? How do you teach empathy? There is no reason to be concerned when they’re this young. Your children – at a very early age have to learn to walk and they’re going to have to learn to talk. And where is that energy coming from? It comes from mom and dad and grandma and other faces and thoughts. But as these lessons occur on a continuing and repeated basis, the repetition leave in the child a remembrance of certain things..and they carry that. A child is exposed. Caring and carrying and raising a baby is a natural process; there is a flow in time. The child learns from what is habit. I love that. You just do and then the child learns through repetition. These are incredible and always powerful words of life lessons you give. Thank you so much. by ELAINESIR January 12, 2018 July 27, 2018 .
by ELAINESIR September 30, 2016 February 19, 2019 .
by ELAINESIR July 15, 2016 June 13, 2018 .
by ELAINESIR April 28, 2016 June 13, 2018 . 10 OF THE BEST PODCASTS YOU NEED TO HEAR! by ELAINESIR April 25, 2016 March 4, 2017 .
by ELAINESIR August 7, 2015 April 7, 2016 .